Once a local outpost of the French diplomatic corps, the Georgian residence exemplifies a fresh yet classic look. 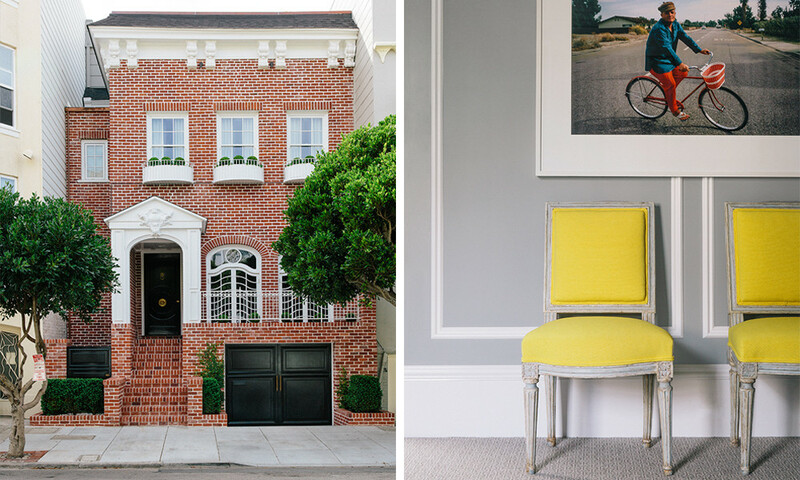 On one of the highest hills in the Pacific Heights neighborhood of San Francisco, a few blocks from romance novelist Danielle Steel’s hedge-shrouded estate, sits a Georgian-style structure with a redbrick facade and doors of high-gloss black lacquer. Formerly the residence of a French government official, the 1867 structure is part and parcel of its posh environs. And yet despite its discreet appearance, there’s nothing stuffy about its presentation. This is a family home whose formality belies its light and youthful touch. The couple and their children had been living in London when the property came on the market in 2010. Having first met and fallen in love in San Francisco in the mid-’90s, during the heady days of the first dot-com boom, Greenleaf and Whipps felt compelled to move back—and the house represented the best of all possible worlds. “It not only seemed English but also reminded us of spaces in Paris: curved French doors leading out to a front terrace, high ceilings with great light coming through the windows,” Greenleaf reminisces. Crucially for a young family who enjoyed an urban environment, the home was also located between two kid-friendly parks and within walking distance of Fillmore Street, with its restaurants, boutiques, and historic jazz district. The herringbone floors throughout the home's first floor were deliberately laid unevenly to lend the semblance and character of age. 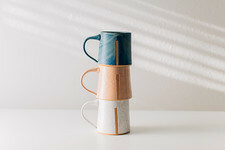 There were certainly cosmetic downsides to the previous incarnation—a renovation in the ’80s had yielded cheap kitchen cabinetry and pink-tiled bathrooms, among other less-than-prescient design decisions. But by far the biggest issue was the lack of garage space in a neighborhood where parking was a nightmare. The process of remedying this involved excavating underneath the house and lifting the entire home using 50 tons of steel rebar, all the while being careful not to disturb the neighboring houses that stood just inches away on either side. A year and a half later, with the help of San Francisco–based Geiszler Architects and Farallon Construction, the family had not only a garage but also a completely reimagined kitchen; new bedrooms and bathrooms; and a modern, light-filled third-floor addition with a guest room, a media center, and a deck with sweeping views over San Francisco Bay. 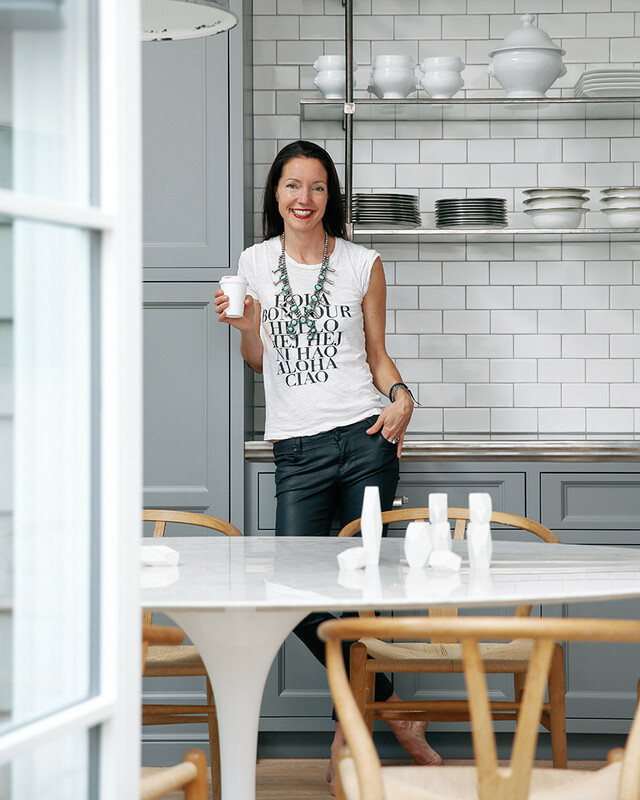 Susan Greenleaf in her kitchen, a symphony of soft gray tones. A gift for bringing impeccable interiors down to earth is evident throughout Greenleaf’s work. 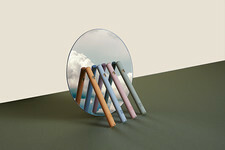 The mood is relaxed, the color story is jovial, and the art—at once cheeky and refined—plays a key role in the mix. In the living room, just off the entry hall, hangs a painting by Rene Ricard that riffs on the masterpiece Arrangement in Grey and Black, No. 1 (aka “Whistler’s Mother”). Framed Damien Hirst skateboards add a sense of lighthearted adolescence to a bathroom. Unexpected wallpapers, such as Scalamandré’s deep emerald-and-silver zebras leaping alongside arrows, give surfaces a dynamic rhythm. 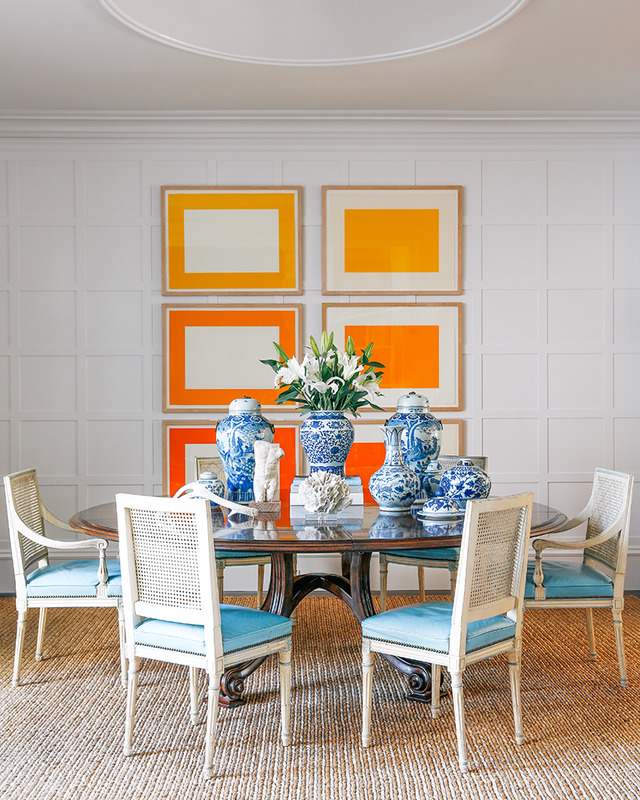 And pops of vibrant hues, including a pair of lemon-yellow upholstered chairs in the sitting room that echo the citrus shades of the dining area’s framed Donald Judd prints, infuse levity into the home’s classic bones. Geometry and juxtaposition play an important role in Greenleaf's interiors. The majority of our furniture is very resilient.... All of it gets better with age. It’s clear that Greenleaf prizes the creation of sensory memories for her own brood. “The kids are central to our lives,” she says. “It was important for us to have a home where Hansen and Quinn and their friends could feel comfortable.” Most of the furnishings in the main living areas were chosen for their resiliency—vintage leather Norell chairs, a PK80 daybed from Belgium, and a gray B&B Italia sectional that has survived many a baby bottle. Even the herringbone floors “look even cooler with the inevitable dings,” she says. (Greenleaf deliberately had the floors installed piece by piece so they were not level—in her words, “a little wonky”—to give the semblance of age.) 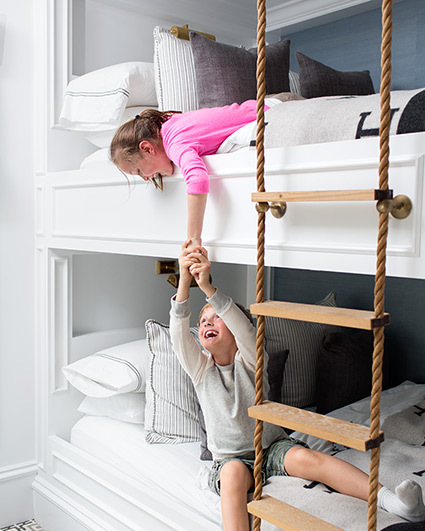 In the kids’ rooms, formal flourishes such as an antique child’s bed and luxury blankets join age-appropriate details such as walls bordered in hot pink and gold, and built-in bunk beds connected by a rope ladder. Quinn (top bunk) and Hansen at play in his room. Damien Hirst skateboards are framed as art in Quinn's bathroom. Plan for unifying elements throughout individual rooms. 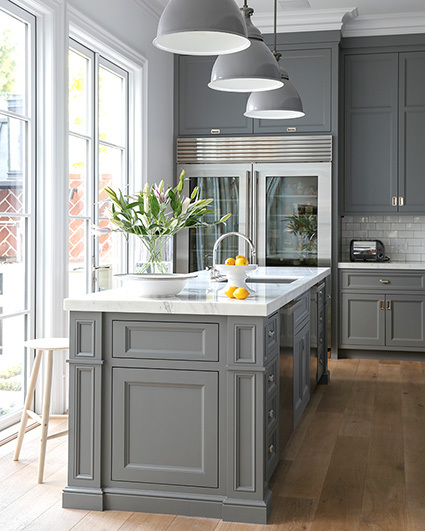 Paint is an easy and affordable way to do just that; Greenleaf used varying shades of whites, taupes, and grays in finishes that range from matte to high-gloss. Identify one or two elements in a room that will draw attention—a fireplace with a mantel on which art can be arranged, a tableau of books and objets on a cocktail table, a large-scale piece of photography that grounds a living room, or a grouping of chinoiserie vases with sculptural blooms. 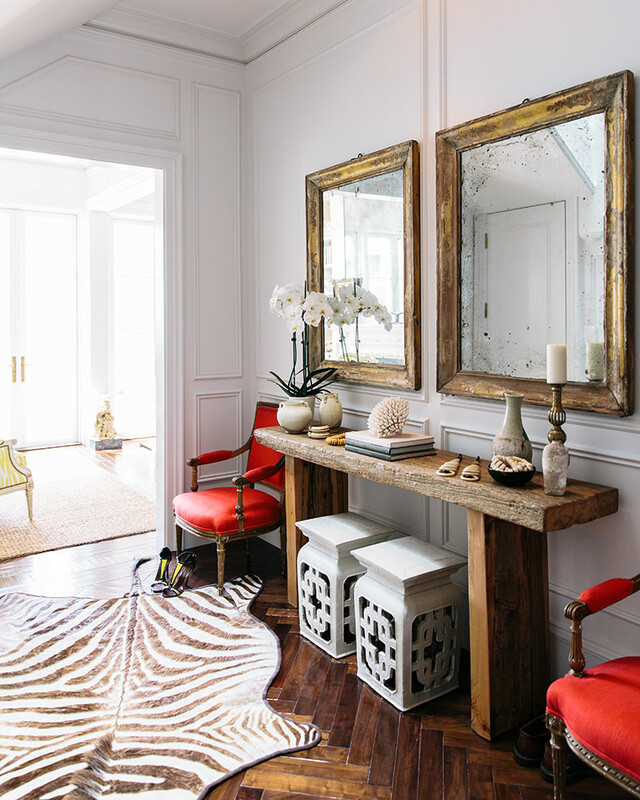 Small decorating decisions make your home feel carefully thought out and less formulaic. Instead of using wallpaper, cover a powder room in a favorite fabric; buy an inexpensive mirror frame and install antique glass. One of Greenleaf’s favorite finds: vintage St. Regis doorknobs she sourced on eBay and installed on closet doors in the butler's pantry and kids' rooms. The modern addition at the top of Greenleaf's home looks out over San Francisco Bay. “No dead space allowed—this was designed to take advantage of the 12-foot ceiling height,” Greenleaf says. Tall cabinets with pullout drawers hold appliances (a Vitamix blender, a Cuisinart food processor), helping avoid cluttered countertops. Open glass shelving holds everyday plates and bowls; below-counter pullout drawers house dinner-party accessories such as formal linens, candles, and coasters. Extra-large platters and vases are stored above the two commercial Sub-Zero refrigerators. Along the left and right sides of Hansen’s and Quinn’s closets, Greenleaf designed both fixed and movable shelving to hold books and small toys. She then installed shoe cubbies beneath them and top and bottom hanging bars across the remaining closet width. “I avoid lots of drawers [for clothes] as things tend to get lost. If I can hang it, I hang it!” she says. A row of baskets between the bars holds T-shirts, socks, pajamas, and bathing suits. More baskets come into play here, organized and labeled neatly on shelves and each containing an arsenal of supplies. “They make [everything] easy to find—and hide,” Greenleaf says.